Choice‎ of chicken or pork w/ garlic & pepper. 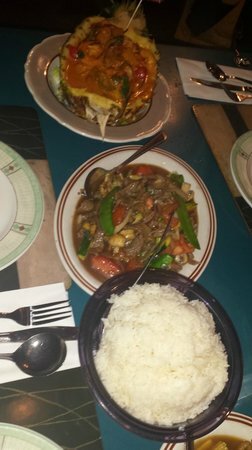 Choice of chicken, beef or pork sauteed w/ basil, chili, mushrooms & peppers. Choice of chicken, beef or pork sauteed w/ ginger, mushrooms, onions & peppers. Chicken prepared w/ light curry & coconut milk. Traditional‎ Thai styled rice noodles w/ chicken, peanuts, egg & bean sprouts. Chopped beef curry served w/ lettuce & tomatoes on rice noodle. Sauteed shrimp & squid w/ chili, basil, mushrooms & peppers. Pineapple fried rice w/ shrimp & squid. Sauteed vegetables w/ garlic & oyster sauce. Springrolls stuffed w/ shrimp. 5 pieces. Springroll stuffed w/ vermicelli, carrots, black mushrooms & cabbage. 4 pieces. Sliced of pork or chicken cooked w/ coconut milk & dried curry, served w/ peanut sauce. Deep fried tofu served w/ sweet & sauce. Fried fish cakes served w/ cucumber & sweet sauce. Hot‎ & sour shrimp soup w/ lemongrass, lime juice & mushrooms. Ot & sour soup w/ lime juice & mushrooms. Hot & sour soup vegetable soup w/ lemongrass, lime juice & mushrooms. Hot & sour soup chicken soup w/ lemongrass, lime juice & mushrooms. Chicken soup w/ coconut milk galanga, chili, lime juice & mushrooms. Bean thread soup w/ pork or chicken. Bean curd soup w/ pork or chicken. Mixed seafood salad w/ crispy cashews. Beef salad w/ cucumber, lettuce, onion, lime juice & hot pepper. Vermicelli noodles w/ minced pork, shrimp mixed w/ hot dressing. Squid cooked w/ onion, lime juice & hot pepper. Grilled shrimp cooked w/ lime juice, lemongrass, onions & hot pepper. Deep Fried rainbow trout w/ mango salad. Steamed shrimp w/ red curry. Chicken prepare w/ potatoes, light curry & coconut milk. Thai green curry made w/ your choice of chicken or beef. Thai green curry w/ shrimps. Red curry fried w/ chicken & bamboo shoot. Beef tamarind curry w/ potatoes, peanuts & onions. Steamed shrimp topped w/ spicy, sweet & sour sauce. Sauteed shrimp, or squid w/ chili sauce. Sauteed shrimp, squid w/ garlic & pepper. Steamed shrimp w/ vermicelli noodles. Sauteed shrimp w/ cashews nuts & dried chili. Shrimp stir fried w/ broccoli. Sauteed shrimp or squid w/ chili & basil leaves. Scallops stir fried w/ snow peas. Shrimp‎ stir fried w/ babycorn & mushrooms. Shrimp stir fried w/ eggplant. Thai green curry w/ vegetables. Eggplant‎ w/ beancurd served w/ chilies & basil leaves. A vegetable blend of colour, flavour & texture sauteed w/ chef's special sauce. Sauteed bean curd mixed w/ vegetables. Sweet & sour sauce mixed w/ vegetable. Vegetables stir-fried w/ basil & chilies. Sauteed chicken, pork or beef w/ chili & basil leaves. Sliced chicken, pork or beef sauteed w/ ginger, mushrooms & onions. Sauteed chicken, pork or beef w/ bamboo shoots & chili. Sauteed chicken w/ cashews nuts & chili. Sauteed beef w/ chili & Thai herbs. Sweet‎ & sour pork & shrimp mixed w/ vegetables. Deep fried chicken served w/ special sauce. Sauteed beef w/ mushrooms, onions & oyster sauce. Hicken‎ stir-fried w/ broccoli & cauliflower. Sauteed chicken or pork w/ garlic & pepper. Fried rice w/ shrimps, onions & tomatoes. Rice noodle sauteed w/ shrimp, peanut, egg & bean sprouts. Rice‎ noodle sauteed w/ peanut, egg, bean sprouts & mixed vegetables. Rice noodle sauteed w/ chicken, peanut, egg, bean sprouts. With chicken, green peppers, egg, bean sprout & curry. Thai style vegetable fried rice. Thai style chicken fried rice. Fried rice w/ chicken, basil & chilies. Thai‎ style spaghetti w/ chicken. Fried vermicelli noodle w/ pork or chicken & egg. Shrimps, squids & scallops w/ variety of vegetables, stir-fried in a delicate sauce served on a sizzling plate. Sauteed chicken, pork or beef w/ vegetables. 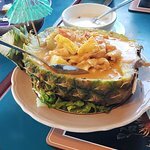 Thai curry w/ shrimp & pineapple in coconut milk. Mixed seafood curry w/ egg & fresh basil. It's been many years since visiting but the Pad Thai at $9.95 for lunch did not disappoint. The portion size was good and service pleasant. Worth returning to sample some other dishes. I can believe it. The restaurant has probably not been updated since opening. The food was OK but there are many better Thai restaurants in Ottawa. Yummy but a bit dated. 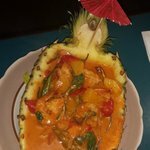 Good quality Thai food from Ottawa's first Thai restaurant. Prices are reasonable, and portion sizes are generous. Restaurant needs an update, both in the decor and the menu. Both are a little dated. Had the opportunity to eat here earlier this month with family....best Thai food I have eaten so far....great service also! 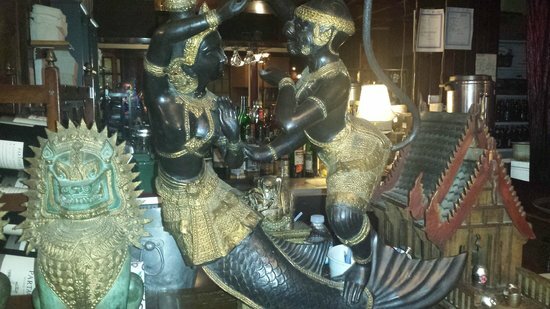 Get quick answers from Siam Kitchen staff and past visitors.